What are these new rules? “[D]emanding accountability and transparency, rewarding measurable results, reinforcing the rule of law, but never imagining for a second that it’s a substitute for trade, investment or self-determination.” Importantly, all of the above are defined, demanded, and enforced by Africans themselves, not international aid givers. Yesterday’s Le Pop, one of Dakar’s several daily newspapers, featured a piece on N’Dour’s work with a well-known local imam to educate Senegalese about the importance of maintaining their 2002 constitution, treating it as a bedrock document rather than one than can be transformed at a sitting president’s will. Grassroots constitutionalism, using the catalyzing power of music and religion. 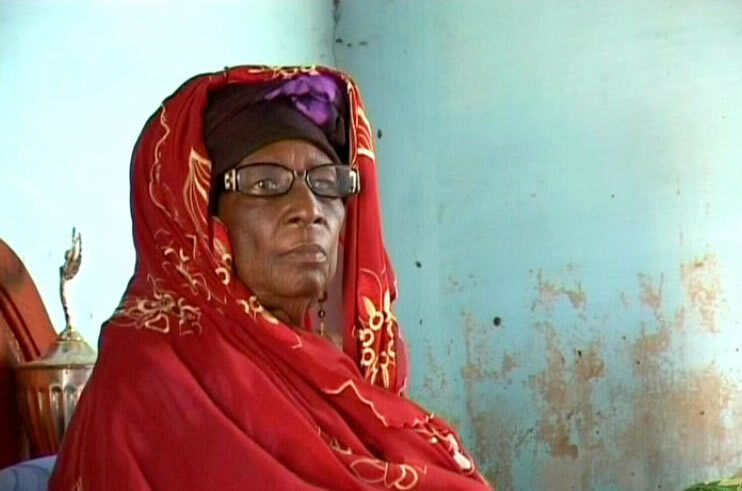 Senegal's next generation of voters and leaders. Although not created by a musician or artist, the Ibrahim Prize has a similar aim to increase respect for constitutional democracy but in a very practical, top-down way. Mo Ibrahim, a businessman who founded Celtel International, a mobile communications company in Africa, has created an endowment for African leaders who serve their people well and then leave office when they are supposed to; in this way, these sub-Saharan presidents avoid what he calls “third-termitis,” when, looking at a bleak future, they trample democratic governance by becoming presidents for life. The Ibrahim Prize consists of $5 million over 10 years and $200,000 annually for life thereafter. The first two prize winners are Joaquim Chissano and Festus Mogae, and the Ibrahim Foundation’s Honorary Laureate is Nelson Mandela. N.B. 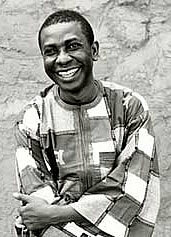 This in from my most loyal reader and uber-researcher, Bill Riley: today’s Guardian ran an article on Youssou N’Dour’s “launch[ing] a political platform” last week when he formed a “public information” partnership with opposition politician Mansour Sy Djamil: “People do not know the constitution well enough. They need to understand that power has its limits. There should be no tinkering with the fundamental law of the land,” he told journalists gathered at his Thiossane nightclub in Dakar. 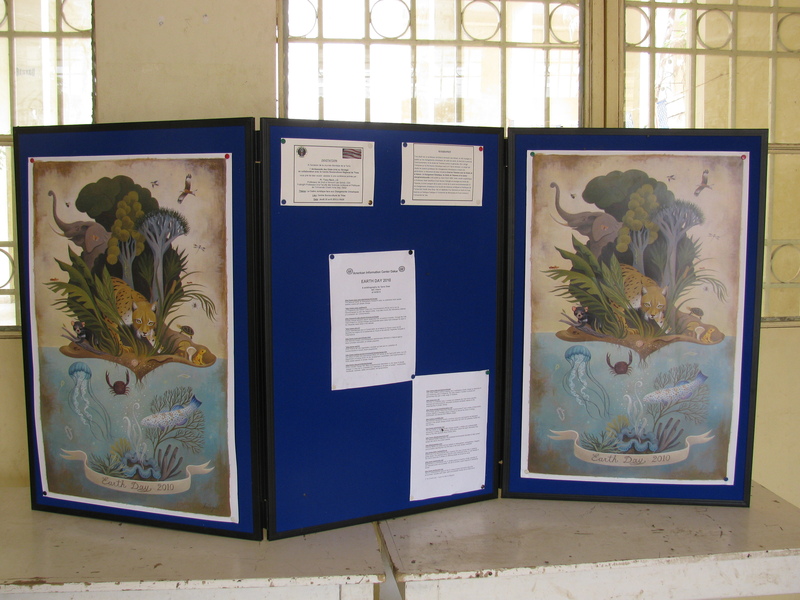 The entrance to the Cultural Center in Thies, adorned with Earth Day posters. While readers in the United States are still busy doing the millions of activities organized this year to celebrate the 40th anniversary of Earth Day, I’m just closing up shop on my favorite one to date. 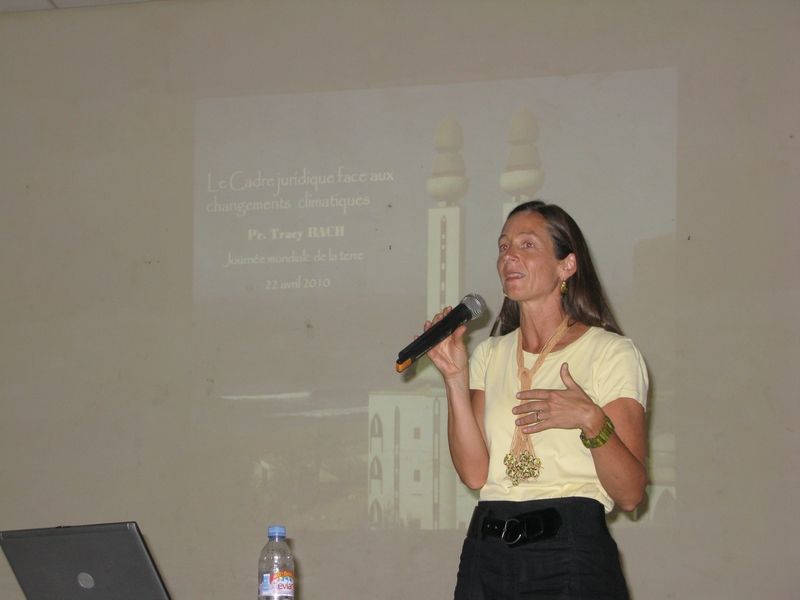 I spent the day in Thies, Senegal’s 2nd largest (but rapidly developing) city, giving a talk about climate change. 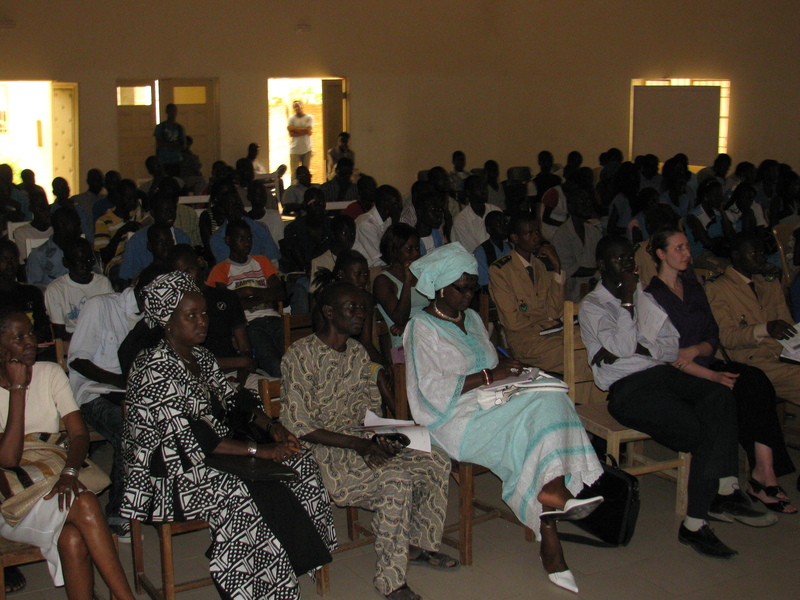 The presentation was held in the town’s Cultural Center, one of a series of meeting places maintained by the government in almost all Senegalese towns of a certain size. U.S. Embassy Cultural Affairs Officer Kristin Stewart celebrates Earth Day 2010 with art, along with its creator, M. Sidibe, at far right. 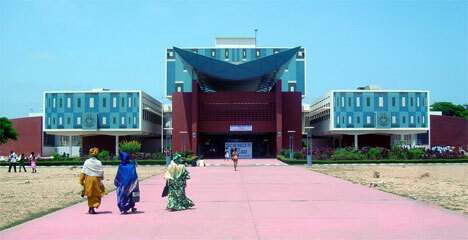 The Center, a concrete structure located on the outskirts of town, houses a reception area, an exhibition space (where currently a Malian born but Senegalese raised artist, M. Sidibe, is showing his work); a large meeting hall with a raised stage; a library; and a set of Turkish toilets (no working flush or chasse d’eau but low water impact!). 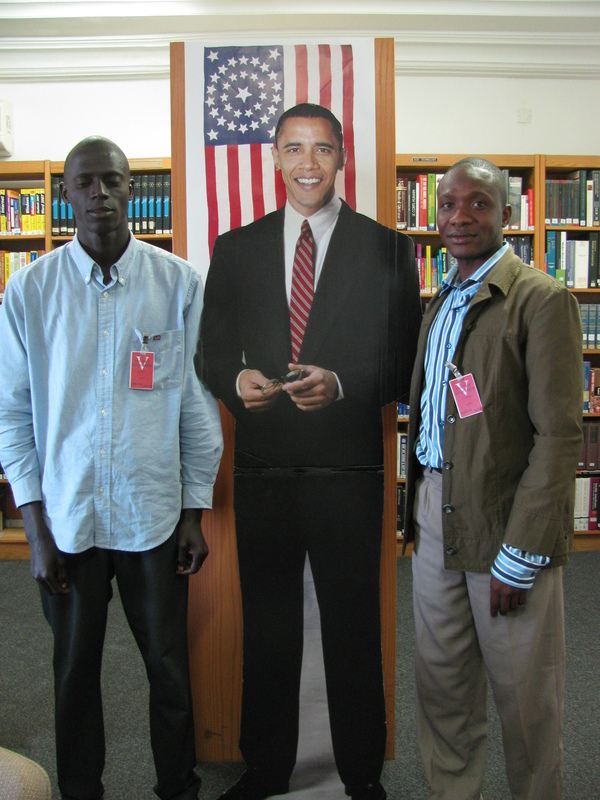 The U.S. Embassy supports a portion of the building, called the American Corner, where it has established a modest library and meeting space and a small internet café. I was invited to speak by the embassy’s cultural affairs officer, to mark this day established in 1970 to learn more about our environment. 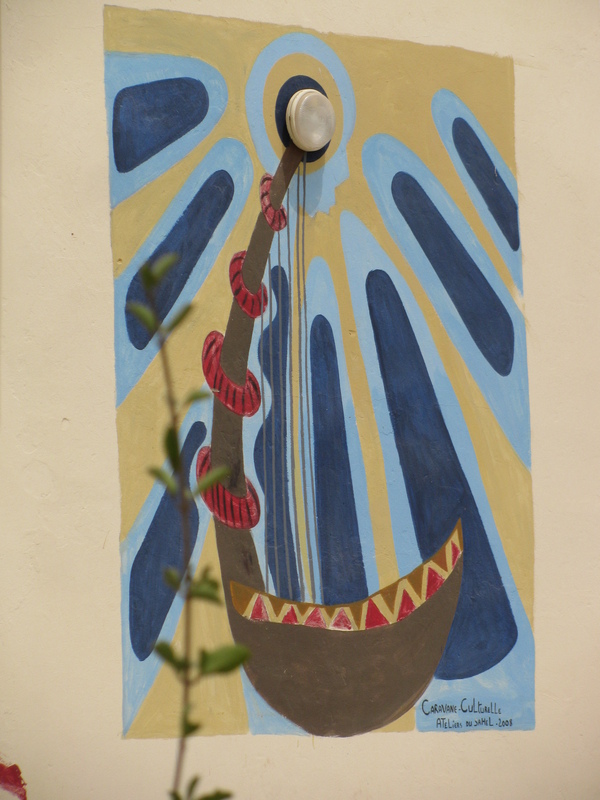 An exterior mural cleverly incorporates the light fixture. So, some Trivial Pursuit questions Earth Day edition. I already gave away the starting year, but how many people from how many countries participated? Answer: 20 million, in the United States only, which came up with the idea (before Congress came up with the idea of passing the Clean Air Act and Clean Water Act). 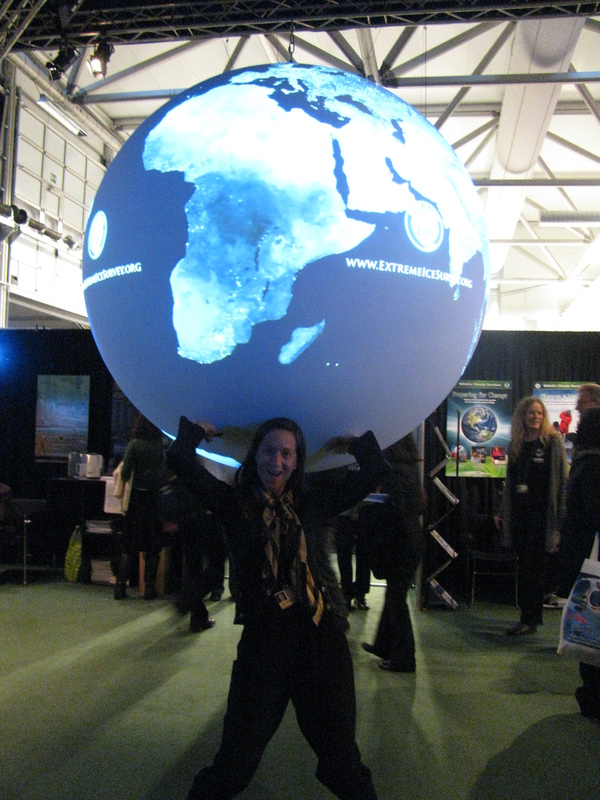 How has Earth Day grown in 40 years? 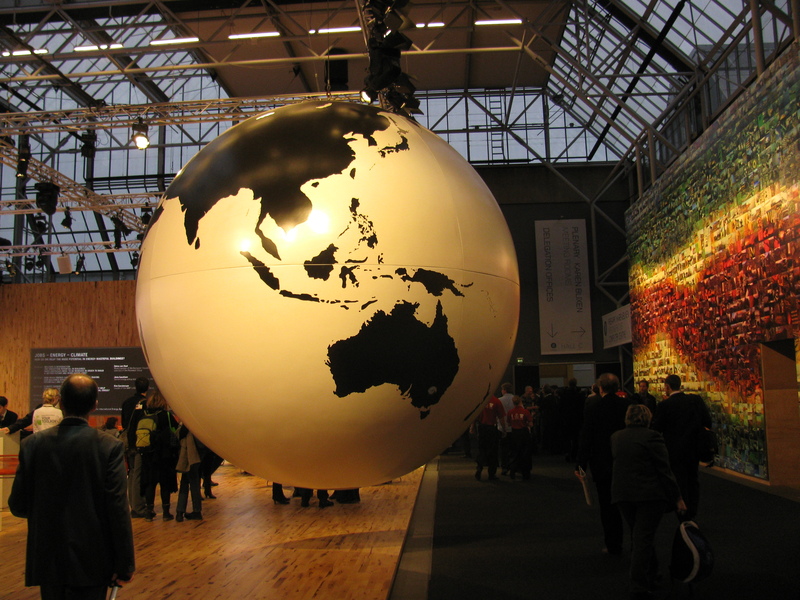 Today, April 22, 2010, it is estimated that 1 billion people in 190 countries will participate in some environmental activity. Over a hundred people attended and I likened our late morning/early afternoon together to a teach-in. Here we were, in a public space, teachers and students, government officials and NGO activists, all assembled to teach one another. The audience included town and regional officials and politicians, teachers, and students. Ostensibly I was taking the lead, explaining the dynamics of climate change, legal responses at the international and national levels, and then concluding with what the individual can do in Thies or Dakar or St. Louis. 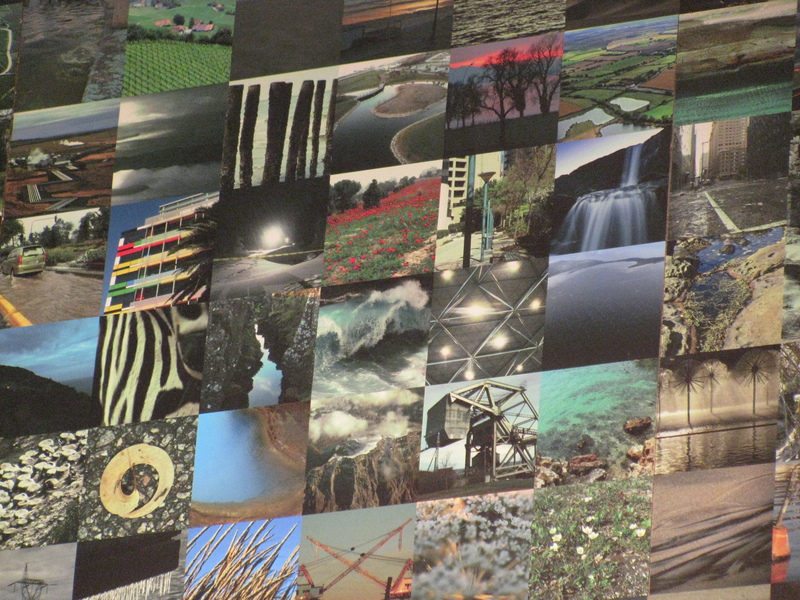 I showed parts of the film, Home, which stunningly portrays the “big picture” idea of man’s disproportionate impact on the Earth through Yann Arthus-Bertrand’s compelling aerial photography. But the terrific questions afterwards showed me how much I had to learn – not only about internal political dynamics in Senegal but also between countries. If I had a nickel for every time I received a variant of the question “why doesn’t the U.S. take responsibility for its pollution and the impact it has on poor countries like Senegal,” I’d be a wealthy or rather, wealthier, woman. Sure, the 70k drive took over two hours, given the constant traffic jams around Pikine and Rufisque. And we started late. And the computer audio wasn’t great at first. And the electricity cut out a few minutes later, during the movie. (Ah, but the generator kicked in not long thereafter!). And it was hot, making me way too grateful for the air conditioning that enveloped me when returning to Dakar in the U.S. Embassy 4 x 4. But all that pales in comparison when spending a great day, in a great town, with great people. This just in from the Pew Forum on Religion and Public Life. (Thanks, Bill!) Would LOVE to hear readers’ reactions. The Pew Research Center has just released one of the biggest ever studies on attitudes to religion and morality in Africa, which has revealed a host of interesting facts. Here are 10 things we (the BBC) have learnt from the study, which surveyed 25,000 people in 19 countries. 1. 75% of South Africans think polygamy is “morally wrong” – bad news for their president, as Jacob Zuma took his third wife earlier this year and is engaged to a fourth. However, the survey also revealed some possible double-standards. While only 7% of Rwandans approved of polygamy (although this did include women), a rather higher number – 17% – of men said they had more than one wife. 2. An overwhelming majority of respondents disapproved of homosexual behaviour. In three countries – Zambia, Kenya and Cameroon – this was a massive 98%. Interestingly, one of the countries with the highest numbers of people – 11% – accepting homosexuals is Uganda, where an MP is trying to get legislation passed which would punish homosexual acts with life in prison and even death in some cases. The former Portuguese colonies of Guinea-Bissau and Mozambique were also relatively tolerant of homosexuality. 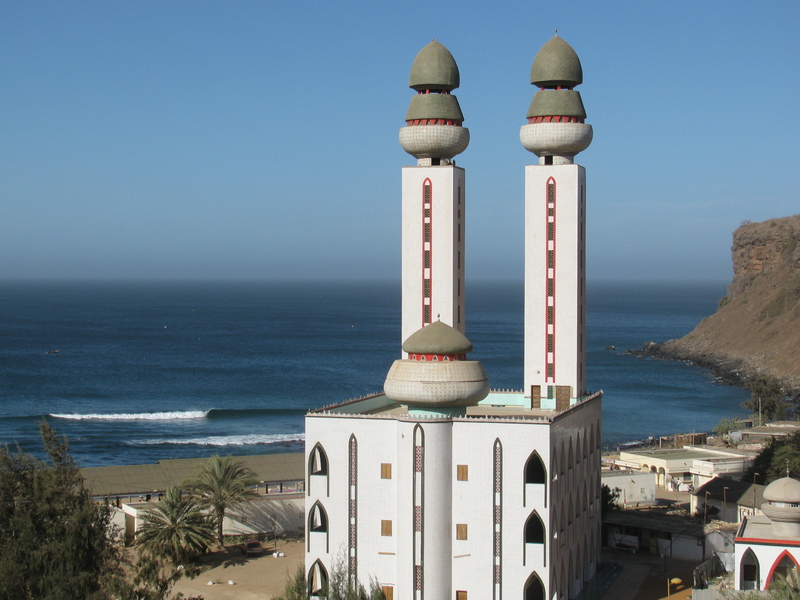 Dakar's mosquée de la divinité on the Corniche. 3. Africa is probably the world’s most religious continent, with more than 80% saying they believed in God in most countries. At least half of the Christians questioned expect Jesus Christ to return to earth during their lifetimes. In Ethiopia, 74% of Christians say they have experienced or witnessed the devil or evil spirits being driven out of a person and in Ghana, 40% of Christians say they have had a direct revelation from God. About half of all Muslims expect to see the reunification of the Islamic world under a single ruler, or caliph, in their lifetimes. 4. Zimbabwe, where the Lemba people say they are the lost tribe of Israel, was not one of the countries surveyed. But 26% of Nigerian Christians said they traced their origins back to Israel or Palestine. 5. Belief in witchcraft is also common – about 40%; a similar percentage also visit traditional healers to cure sickness. Belief in witchcraft is highest in Tanzania with 93% – this is the country where witchdoctors say that magic potions are more effective if they contain body parts of people with albinism. Ethiopia had the lowest levels of belief in witchcraft – at just 17%. Belief that juju or sacred objects can prevent bad things happening was generally lower – between 20 and 30%. In Senegal, however, 75% thought such things worked – far higher than in Tanzania (49%). It may come as a surprise to learn that South Africa had the highest number of people – 52% – saying they took part in ceremonies of traditional religions, or honoured or celebrated their ancestors. 6. Predictably, there was also a religious split concerning alcohol, banned by Islam. Surprisingly, however, more Muslims in Chad (23%) approved of booze, than Ethiopian Christians (5%). This comes as a huge surprise to Ethiopia experts, however, who point out that it is traditional to welcome Orthodox Christian clergy with traditional honey beer when they visit your house. Maybe “alcohol” was only taken to mean spirits by some of the respondents? 7. Attitudes to divorce showed a strong divide along religious lines in Nigeria. A massive 79% of Christians thought it was “morally wrong”, while among Muslims, a narrow majority (46-41%) accepted divorce. 8. In recent years, Islamist hardliners in Somalia and Nigeria have introduced strict punishment based on Sharia law, such as amputating the hands of thieves and even stoning to death for adultery. The majority of people disapproved of such Sharia punishments. In Nigeria, they were backed by about 40% of Muslims and less than 10% of Christians. However, a majority did approve of whippings and amputations in Senegal and Mali. In nearby Guinea-Bissau, even 50% of Christians backed them. This was double the rate among Muslims in Ethiopia (25%) – maybe it feels like a more realistic prospect to them, as they share a border with Somalia and most Muslim Ethiopians are ethnic Somalis. 9. The survey also asked about material well-being in the world’s poorest continent. Not so long ago, Cameroon regularly topped surveys of champagne consumption per head. However, a shocking 71% of Cameroonians surveyed said there were times in the past year when they did not have enough money to buy food. In Ethiopia, which is commonly seen as a country struggling to feed itself, the rate was far lower – at 30% – the lowest of all countries surveyed. 10. Ethiopia did, however, have the lowest numbers of people – 7% – who said they regularly used the internet. Rwanda’s President Paul Kagame is striving to turn his country into Africa’s answer to Silicon Valley and is being helped by the arrival of several new fibre optic cables off the east coast of Africa. He will be encouraged by the finding that 30% of his countrymen – the highest number – regularly browsed the web. Mobile phones, were far more common – with 81% of respondents in Botswana owning one. Many countries reported more than 50% having phones but here, Rwanda lagged behind at just 35%. 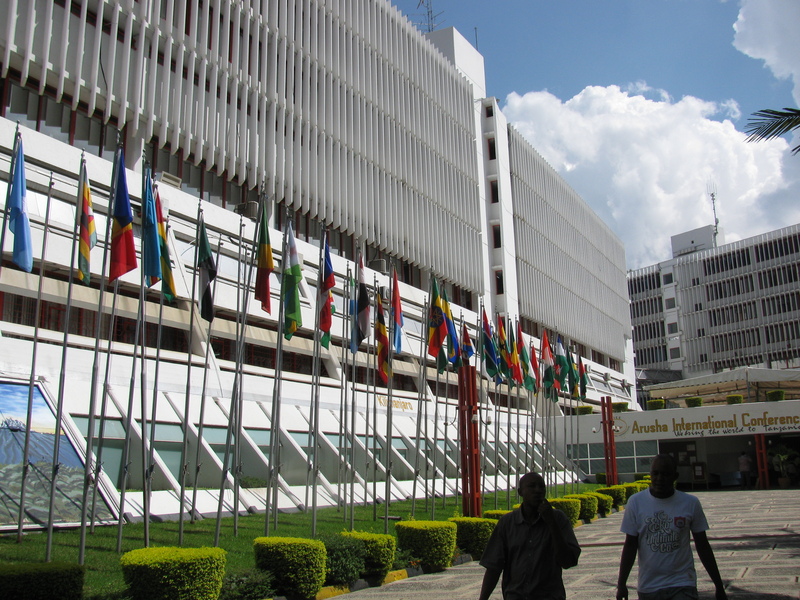 The Arusha International Conference Center, sometimes called the Geneva of East Africa! The flags were abloom in honor of the visiting dignitaries for African Environment Day. While visiting the International Criminal Tribunal for Rwanda (ICTR) last week, I happened on to the African Environment Day celebrated every year on March 3. This celebration was created in 2002 when the Council of Ministers of the (then) Organization of Africa Unity (OAU), now the African Union (AU), adopted the idea proposed by Libya. The AU tapped Tanzania to host this year’s meeting, which was entitled “African Resilience to Climate Change: Protecting Biodiversity and Enhancing Traditional Knowledge.” Participants included Environment Ministers from many African countries, as well as representatives of the AU, UNEP, the Convention on Biodiversity Secretariat, the World Meteorological Association, World Wildlife Foundation, and the UNFCCC Secretariat. After a series of presentations by experts on resilience, REDD, and the biodiversity conservation, the conference delegates adopted the Arusha Communique on African Environment Day. Active learning was also the order of the day, with a tree planting ceremony, REDD initiative showcasing, and field excursions (safaris) to Arusha National Park and the Ngorongoro Conservation Area. 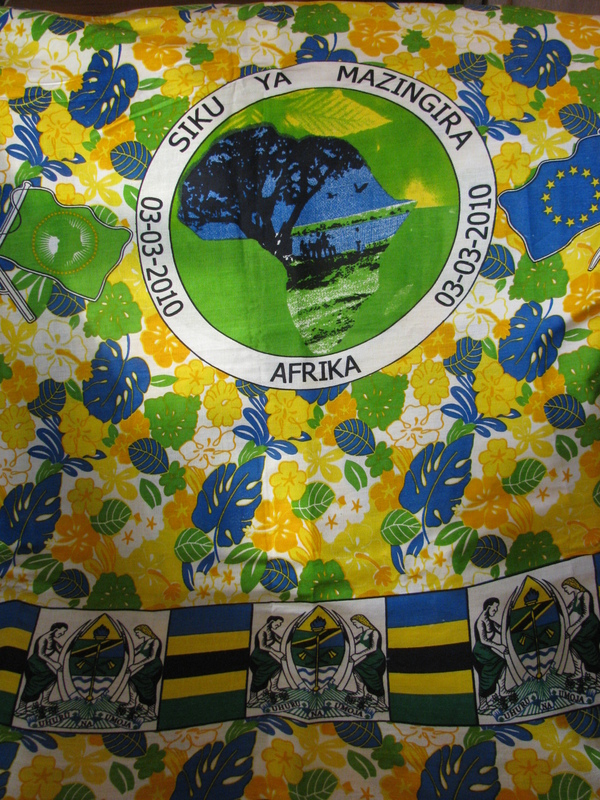 The cloth that caught my eye: the African Environment Day logo in the center and the Tanzanian seal at the bottom. 1. Yields from rain-fed agriculture in Africa (the most common kind) will diminish 50% by 2020. 2. These reduced yields affect food security and health, as well as individual economies, given the large role agriculture plays in most African countries’ GDPs (10 – 70%). 3. Interacting climate change impacts and feedbacks multiply the hardships. For example, the melting glaciers of Mount Kilimanjaro (in Tanzania) result from a combination of global warming, solar radiation, vegetation changes, and human interactions. Between 1912 and 2003, approximately 80% of the glacier surface has disappeared. Of course, I only learned of this event because of the beautiful fabric at right. Fabric and baskets are my Achilles heel. So when I walked into the Arusha International Conference Center, the ICTR’s landlord, and saw a registration table cloaked in this colorful fabric, I had to know more. 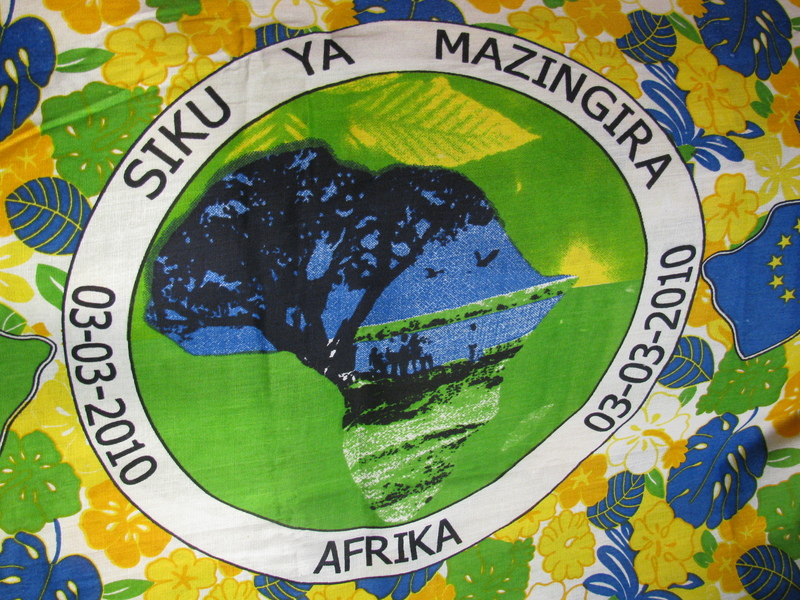 The logo in detail: iconic images of Africa within the continent's borders encircled by African Environment Day in Swahili. A quick peak at the conference brochure spoke to the climate change topic and so I promptly introduced myself, presented my business card, and explained my interest in climate change impacts on Africa. Fortune smiled on me that day, for the patient perseverance skills honed in Rwanda and Senegal produced an introduction to Joseph Qamara, Private Secretary to the Minister of State (Environment). Mr. Qamara listened respectfully to my (admittedly odd) request to obtain some of this fabric, and gave me an opportunity to tell him about the Vermont Law School, its environmental law program, and my Fulbright work on climate change in Senegal. Two days later, he called on me at my hotel and presented me with the conference briefcase and portfolio, beautifully decorated in the Tanzanian flag’s brilliant yellow, blue, black, and green hues; commemorative caps and shirts; copies of the papers and speeches given at the conference; and THE fabric that had covered the registration table. Beautiful! Having been on safari with my family in the Serengeti, Ngorongoro Crater, and Tarangire, celebrated New Year 2003 in Zanzibar, and then later climbed Mount Meru with girlfriends and driven to Malawi via southern Tanzania, I’ve long admired the beauty of Tanzania’s varied flora and fauna and the warmth of her people. Asante sana many times over. The colonial look of the CCF. Cinema is on the lower level at left. 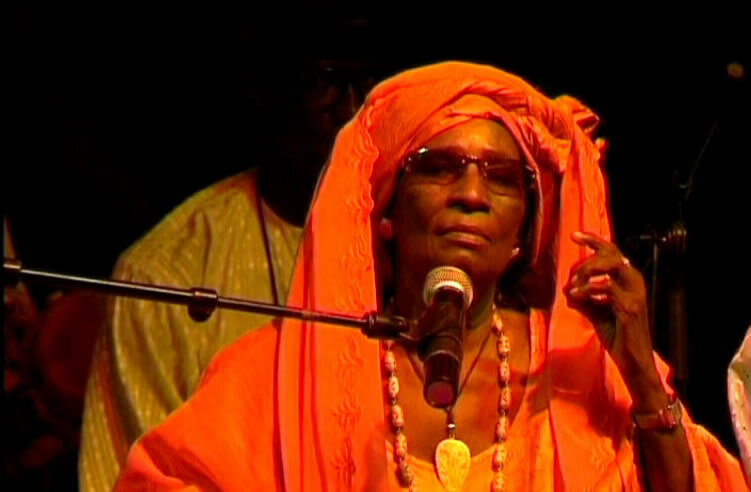 Arts and culture were back on the front burner of Simmering Senegal this weekend. I spent Saturday and Sunday at my favorite downtown spot, the Centre Culturel Francais, attending a documentary film festival for young West African directors and writers, Le Festival Lumière d’Afrique. On Saturday night, we all (Matthew under forced marching orders) attended a modern dance performance at the Theatre National Daniel Sorano sponsored by the U.S. Embassy in honor of African American History Month. The film fest was fab. I attended 8 of the 10 screenings, and only walked out on the second to last, which struck me more as a rap video than a documentary. 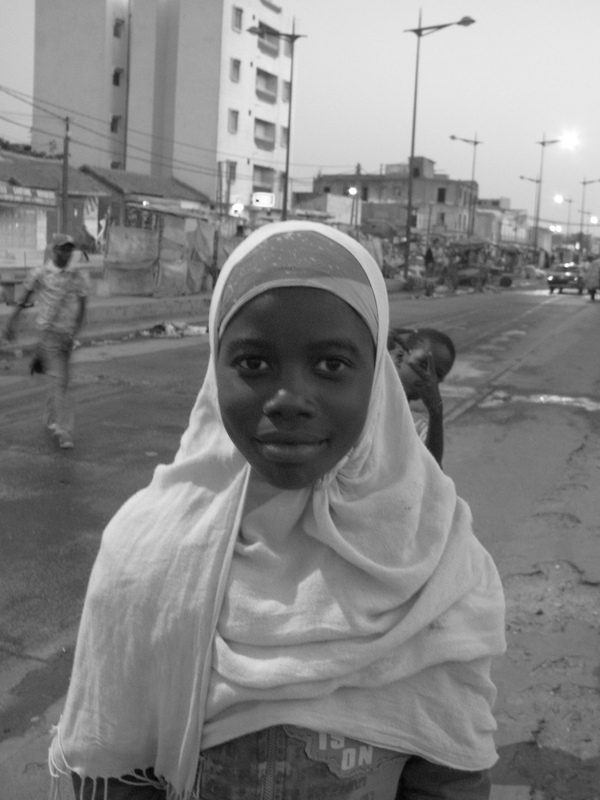 The films came from all over West Africa: Togo, Mali, Niger, and of course, the hometown favorite, Senegal. The topics ranged from traditional adoption in Mali gone awry in modern Bamako and Senegalese wrestlers in Pikine to the pressure felt by a red onion grower in Niger trying to grow as much and sell as high as possible to marry his daughter properly as well as that felt by a young Zinder king who wants to modernize his tribe’s cattle raising techniques to export more widely. Yandé Codou, performing at the Sorano in earlier years. 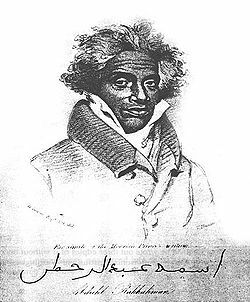 One of my early favorites featured Yandé Codou, la griotte or praise singer of Léopold Sédar Senghor, Senegal’s first president post-independence. This 80+ diva is still sassy, hinting at her intimate relationship with Senghor and telling a modern interpreter of her songs on camera to stop trying to imitate her because he was too inferior. Although not as high on my list, the documentary on Togo’s last political succession (note the term used, even though this father to son hand-off was cloaked in the guise of an election) was impeccably timed, for Togo is getting ready for another round of presidential elections at the end of this month. When I took my coffee break in a nearby café just after viewing this film, I picked up the most recent copy of Jeune Afrique and saw President on the cover, giving his first interview in three years. Yandé Codou in more recent years. In the end, I voted for a last minute substitute (for an unfinished film) as my film fest favorite. It centered on the intertwined stories of a homeless man at a bus shelter who speaks truth to power in poetry and an unemployed train worker who spends his days bumming money off friends, drinking beer with the proceeds, and writing this documentary’s manuscript. The villains are the World Bank and its structural adjustment policies, which forced the country’s public train system into privatization, which in turn resulted in many lay-offs. The camera technique was sophisticated. But even more striking was the dramatic storytelling that the directed achieved while documenting the day-to-day activities of an unemployed train worker. The acting was superb. I had to leave before closing ceremonies, so I don’t know which film one. And the winner is . . . . 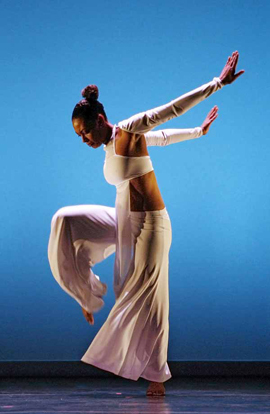 The contemporary dance performance Saturday night was equally spectacular. 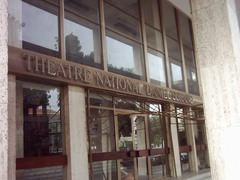 It was fun to go inside Senegal’s national theater, having passed it so many times when riding buses downtown and seeing its interior in movies and t.v. shows. 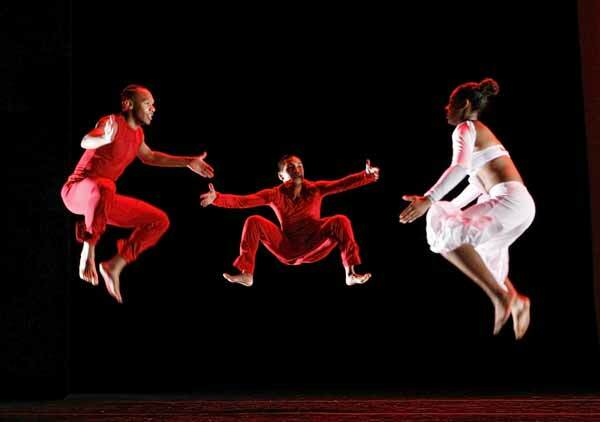 The featured dance troupe from the U.S., called Evidence, was led by choreographer Ronald K. Brown. Evidence was preceded by a traditional Senegalese dance troupe called Kondiof. Their performance was gorgeous, with three drummers and 16 dancers divided equally between men and women. The drummers filled the large hall with sounds, while the dancers occupied the stage with bright colors and pulsating rhythms. Evidence’s first number echoed many of the same dance moves, making the connection between Africa and the diaspora physically clear. The music was fantastic, ranging from soul to gospel to classical and back. The troupe was small, so over the course of 90 minutes divided into three separate movements, I felt like I really got to know these dancers as individuals. I’m not a dance fan, but found this performance riveting. This week began with a wee hours Super Bowl party and is ending with a Presidents Weekend softball tournament at Ebbets Field, with a class trip to the U.S. Embassy’s American Information Center (AIC) and a Fulbrighters’ Game Night chez nous sandwiched in between. 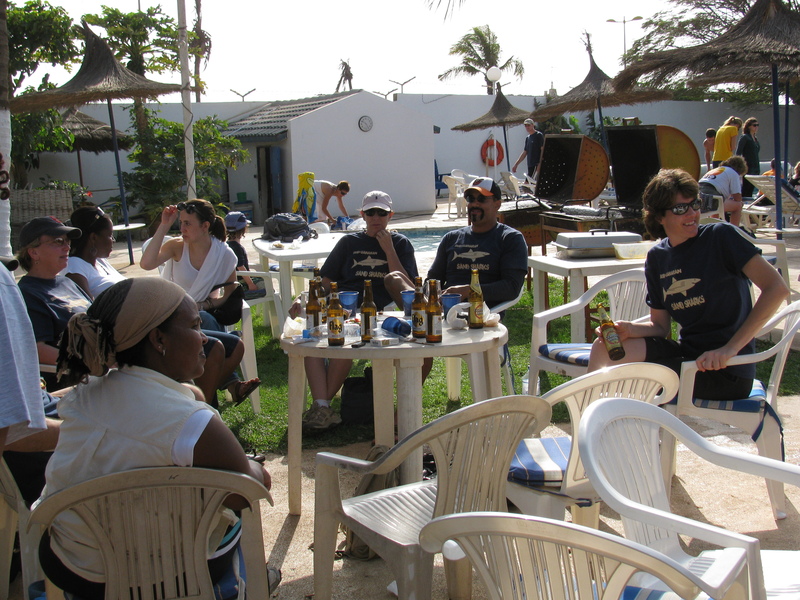 Life in Dakar never felt so American. Official team portrait, Sand Sharks 2009-10. 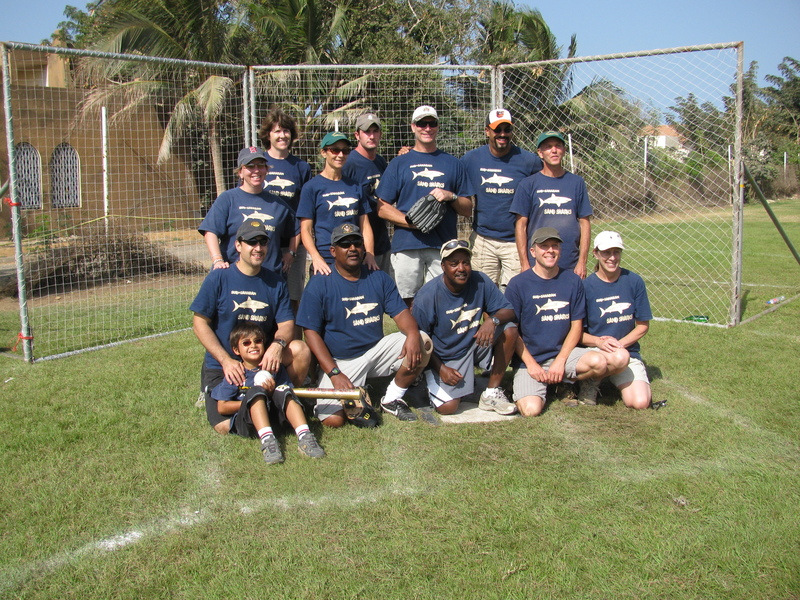 Our softball team, the Sand Sharks, played well, earning a respectable 3 – 1 record in the preliminary rounds. We lost our first game to the team that is playing in the finals (as I write). The scene around us was wild. The West African Invitational Softball Tournament (WAIST) (or WASTE, as it has been nicknamed) brings in Peace Corps Volunteers (PCVs) from all over West Africa – some 500 or so, it’s been said. Sand Sharks, the unofficial portrait; training for the "social" league. Host families provide free lodging, the Club Atlantique provides the central meeting point, and the embassy and U.S. mission volunteers organize a field-plex of games and concessions at Ebbets, ISD (Matthew’s school), and Suffolk University/ENEA. Hot dogs and pulled pork, Coke and plentiful beer, Doritos and potato chips, and Snickers, Chips-Ahoy, and Sweet Tarts round it (and us) all out. We’re not in Dakar anymore, Dorothy. 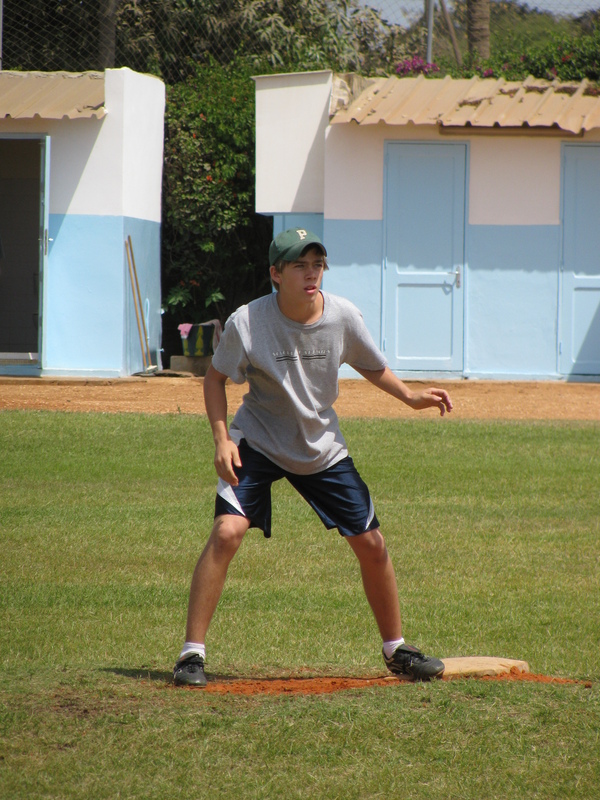 Matthew at second base, ready to run. Matthew also played on a team, composed of ISD students, which was organized at the last minute. ESPN highlights moments for him were a diving catch at short to end their first win of the day and an over-the-wall home run in their second win. A kindly fellow ball player searched the underbrush for the ball and presented him with it. Overall the team went 2 & 2. A terrific showing, for most of his teammates have never played baseball or softball before, hailing from the Netherlands, Sweden, Burundi, Portugal, France, Belgium, Germany, Lebanon, Japan, Eritrea, and, of course, Senegal. A good time was had by all, especially the PCVs. The contingent from southern Senegal (Tabacounda and Kedigu) assumed a caveman motif, while those from Kaolack were lumberjacks. Lumberjacks cheering on their team. Our last game, against Pebbles and crew, had us sharing our gloves with them and them sharing their club/bat with us. They began the game by forfeiting, then saying “let’s have fun.” Watching these young Americans, who spend two years living in the bush, in villages and small towns without running water and electricity, learning local languages and eating local food, and becoming an integral part of their communities, is inspiring. Whether playing ball, drinking beer, or just fooling around, you can’t match their intensity. Well, save for Senegalese law students who have beaten the odds to make it to the masters 2 research program in which I currently teach. In the law faculty, the typical first year class numbers 7000-9000. By the second year, they’re down to 4000 and by the third year license degree, the numbers have sugared off to the mid-hundreds. To be promoted from license to masters 1, and then again to master 2, takes an effort. Classes are often cancelled because professors aren’t available. Library resources are thin. Electricity outages interrupt the schedule (as they did for me back in October). Strikes shut the university down completely. Listening to Monsieur Sene at the AIC. My current students, who are in the M2 recherche droit de l’environnement et de la santé, will finish their degrees with a memoire or master’s essay. They are currently working under a deadline to finalize their topics. They also have a written take-home exam for my seminar, Les aspects juridiques des changements climatiques, as well as an oral presentation. So when I learned that the AIC has a small legal collection in hard copy and on-line access to legal journals, all free and open to the public 5 days per week, I organized a field trip. M. Sene was popular, and the big guy behind him was too. About 20 students attended, which surprised me. The U.S. is not always looked upon so favorably, despite the high esteem President Obama is held in. And the embassy, with its many security guards posted at concrete barriers closing off several streets in the vicinity, doesn’t look like such a welcoming place. Fortunately, my students passed through security with relative ease and filled up the entire library and computer lab, which had been reserved just for them. AIC director Stephen Mallinger and assistant director, Demba Sene, introduced my students to the collection, reviewed research techniques, and then let them loose in the facility, to look through books and take turns on the computers doing on-line searching in a proprietary legal periodical database that the AIC subscribes to. Although I teach class in French and students are more comfortable speaking, reading, and writing in French, they did their best to follow the segments taught in English and to practice speaking. Plus the AIC’s translator software, which enables easy conversion of HTML documents from English to French, made this transition a bit easier. AND it’s a great place to be photographed with President Obama. On the left, you see class responsables or student leaders Badji and Pascal, striking the pose adopted by most of the rest of their colleagues at the close of our research class. (See the photo gallery on the right for the rest of these photos). Word on the street the next day at la fac was that the U.S. embassy library is very welcoming and good place to work. Score one for another great American: free public libraries. 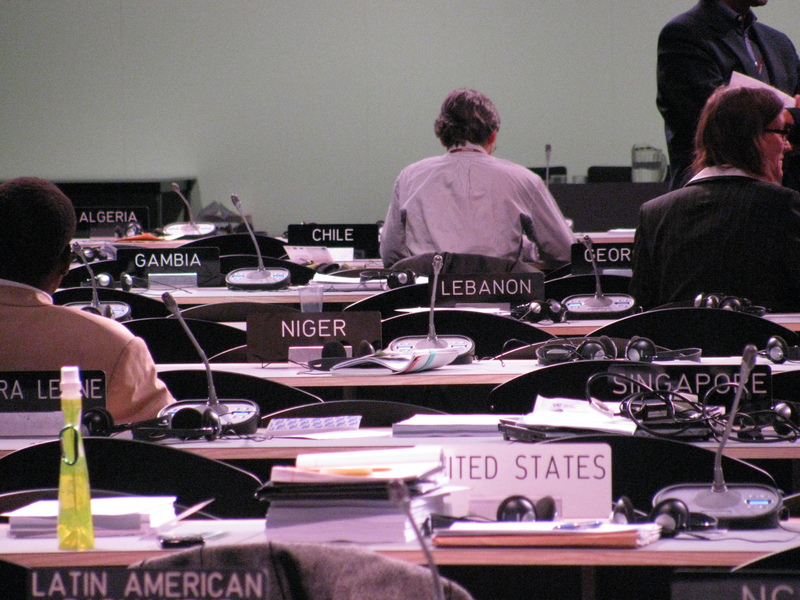 The consensus rules that govern UNFCCC COP plenaries, set up in the convention itself – important tools for diplomacy and equity when seeking international accord – encouraged the African country walk-outs that began in Barcelona and enabled Tuvalu’s well-chronicled procedural points of order at COP15. These principled stands by the have-nots in the climate divide were significant expressions of their deeply felt frustration with the industrialized world’s unwillingness to take responsibility for the impact of their historical CO2 emissions. 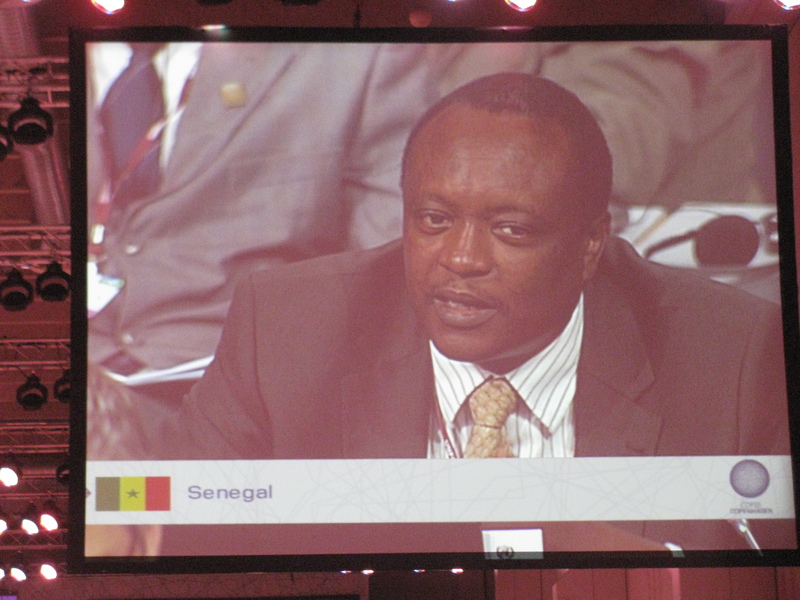 COP15 also showcased those fractures within the developing country groups. Some rough statistics paint a picture of the potential for splits within one half of the climate divide. The G77 + China no longer counts 77 developing countries among its members, as it did at its founding in the mid-60s. Rather, it now includes a range of developing countries who contribute to 42% of GHG emissions, 19% of the global GDP, and 76% of the world’s population. In contrast, the Africa Group, usually thought of in terms of the 50-member African Union or AU bloc, which forms a subset of the G77, presents an entirely different picture: 3% of emissions, 2% of GDP, 13% of population. Clearly these two groups share a common climate change bond in that they missed the 19th century industrialization that created the current carbon build-up in the atmosphere. But in terms of current CO2 output, they are night and day. So where does “Africa” stand in this new definition of the climate divide? Well, probably the first place to start is a quick geography lesson. Sarah Palin has plenty of company when she gives a supposedly parallel (ok, I know she’s not concerned about parallelism) list of countries and sticks Africa in the middle of it. Africa is a continent, folks, composed of 53 countries (if you count the island nations near it; 47, if you limit yourself to the continent). Climate change is having a different impact on different African countries, with my current neighbors in the Sahel experiencing increasing periods of drought and expanding desertification while South Africa and parts of east Africa are having record rainfall. Next, we should take a look at a group called BASIC – Brazil, South Africa (dites le en français, l’Afrique du Sud, et le sigle marche mieux), India and China – and note that these four economies emerging out of the developing country pack played a key role in Copenhagen. They were in the room for the final negotiating session breathlessly described here. 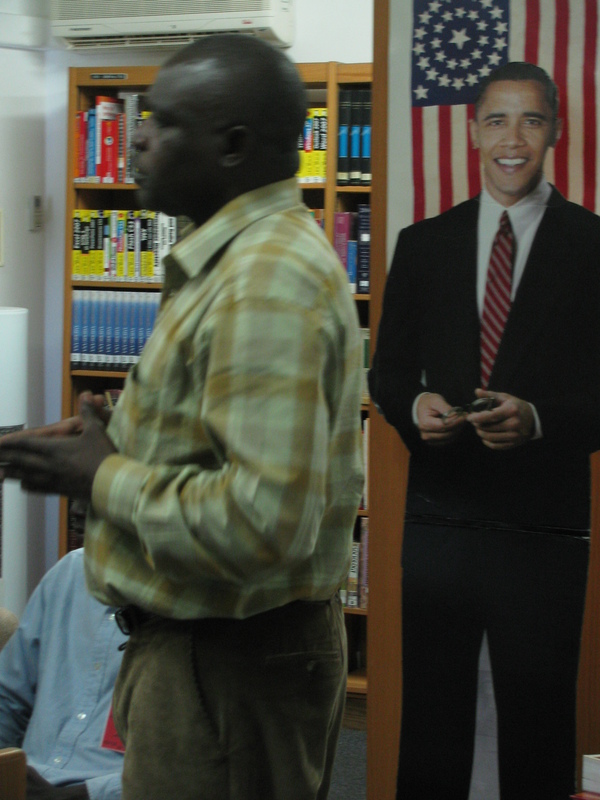 President Zumu of South Africa was in the meeting room when President Obama and Secretary Clinton swept into it. Sudan wasn’t. The blow by blow of the final hours of negotiating the Accord by NRDC’s David Doniger aptly analyzes the shifting alliances beyond the developing/developed country fault lines (section 4 is especially on point). So South Africa voted to “take note of” the Copenhagen Accord. (See this terrific explanation of this term of art and others by the World Resources Institute.) And Sudan, along with Bolivia, Cuba, Nicaragua, and Venezuela chose not to. As an increasing number of countries on the African continent continue to see increased but sustainable economic growth as the ticket to modernity, the climate divide will shift even more to focus on current emissions rather than historical industrialization. Last week, the MacArthur Foundation, Earth Institute at Columbia University, and the Université Cheikh Anta Diop (UCAD)’s Faculte des Sciences Economiques et de la Gestion (FASEG), announced their partnership to offer a new Global Masters in Development Practice (MDP). 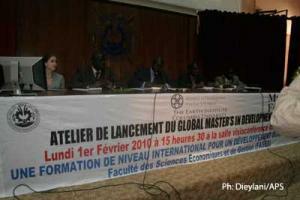 In a launching ceremony in the grand amphitheater of the modern UCAD II building, UCAD’s Rector Abdou Salam Sall, along with FASEG Dean Ali Mbaye and a representative of the MacArthur Foundation, described the need for this new masters degree, the course curriculum and objectives, and the worldwide network of which UCAD’s program will be a part. 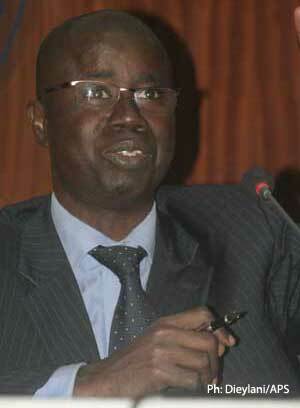 See Senegalese press releases here, here , here, and here. 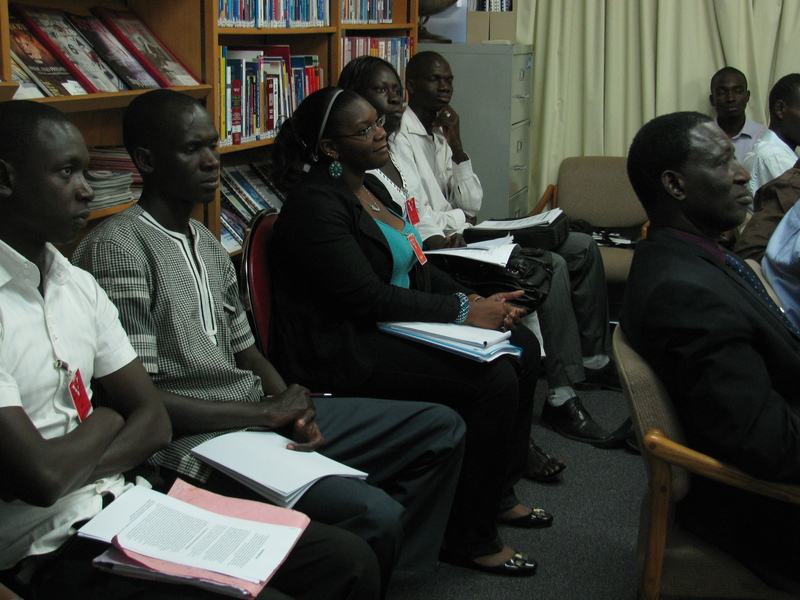 In response, the Foundation has dedicated $15 million over three years to create and launch a two-year bilingual (French/English at UCAD) masters degree that will train people to be “ready for the challenge of sustainable development.” Emphasis is placed on multidisciplinary education, emphasizing five related subjects: poverty, population, health, climate change, and agricultural productivity. The MDP will be offered at 15 universities worldwide. The first 10 were chosen in June, 2009. UCAD/FASEG’s original partners include Emory University, Columbia, The Energy and Resources Institute (TERI) University of New Dehli (known for its work on the IPCC’s Fourth Assessment synthesis report) , James Cook University of Australia, Trinity College and University College of Dublin, Tsinghua University of Beijing, University of Botswana, University of Florida, and University of Ibadan in Nigeria. In October 2009, the MacArthur Foundation added five more academic institutions to the MDP global network, including BRAC Development Institute/BRAC University of Bangladesh, CATIE of Costa Rica, University of California at Davis, University of Peradeniya in Sri Lanka, and University of Waterloo in Canada. Other universities will launch an MDP program but with funding from other sources. These include the University of Minnesota (at my alma mater, the Hubert H. Humphrey Institute of Public Affairs, headed up by my all-time favorite professor, Ragui Assaad ) and the University of Denver. The top five things that stood out to me during last week’s presentation? 5. A much needed focus on interdisciplinary education, which will be especially important for the evolution of Francophone education, which is rigidly silo-ed. 4. A much needed focus on practice, to complement the theory taught in academic programs (ditto #5 on French educational practice). The on-site, hands-on work, linked with the Millenium Villages Project (one of which is located in Potou, Senegal) is a great application of service learning principles. 3. FASEG’s dynamism, led by its bilingual dean, to compete on the international stage to become one of seven universities that made the final cut and the go-to hub for Francophone Africa. 2. The focus on bilingual education, which will give UCAD’s students yet another nudge to perfectionner their English. 1. Where is LAW in this masters program? The nod to social sciences is clear, but when you dig into the curriculum and profs listed both at the FASEG and MDP Secretariat sites, law is scarcely mentioned. Law codifies societal norms and drives them, both intentionally and accidentally. Given the Vermont Law School’s interdisciplinary work in environmental law and policy, I can’t imagine creating a global master’s in development practice that doesn’t factor in the impact of law and the need to educate practitioners on how to contribute consciously to the rule of law around the world. African–American history month is being celebrated on this side of the Atlantic. On Friday night, I attended a screening of Prince Among Slaves. This 2007 film tells the extraordinary story of Abdul Rahman Ibrahima, son of a Fula king in the Fouta Djalon highlands (on the Guinean border with Senegal), who was captured during battle and sent to Mississippi as a slave. 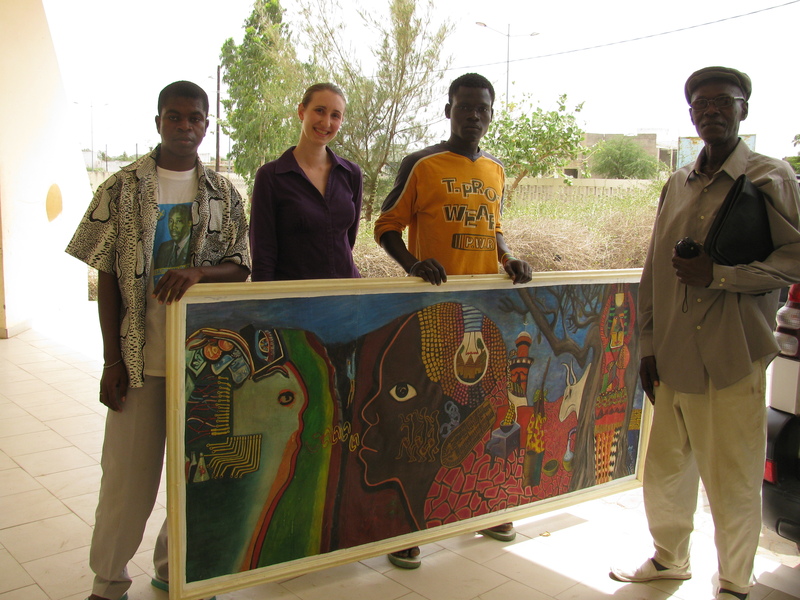 The Centre de Recherche Ouest African/West African Research Center (WARC) co-sponsored the event along with the Direction de l’Animation Culturelle et Sportive (DIACS)/Cultural and Sports Programming Bureau of the Université Cheikh Anta Diop (UCAD). The event was also supported by the U.S. Embassy’s Cultural Affairs Office. (See this press release in French.) Just as fascinating was the debat or question and answer session that followed the movie. The Sultan of Morocco asked President John Quincy Adams and Secretary of State Henry Clay to release the slave. In 1828, under pressure (and arguably, when Prince’s economic value had diminished due to old age), Foster agrees, as long as Prince returns to Africa and is not considered to be a free man in the United States. Prince has enough money to buy his wife’s freedom but not that of his children, so he and his wife leave them in Mississippi, vowing to reunite in Africa. After almost a year traveling in the north, lecturing and raising funds, he and is wife depart for Monrovia, Liberia, where Prince dies of a fever four months later. 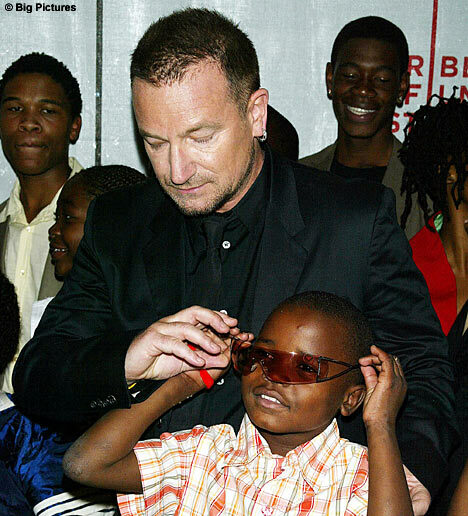 Although insufficient to buy the freedom of all of his children and grandchildren, the funds freed two of his sons and their families, who then joined Prince’s widow in Liberia. The movie ends with a 2006 reunion of the American and African descendents of Prince on the old Foster plantation. The post-screening discussion proved just as revelatory. First, a delegation from Elizabeth City State University, a North Carolina historically black college founded in 1891 to train teachers, spoke about its service work in Senegal. 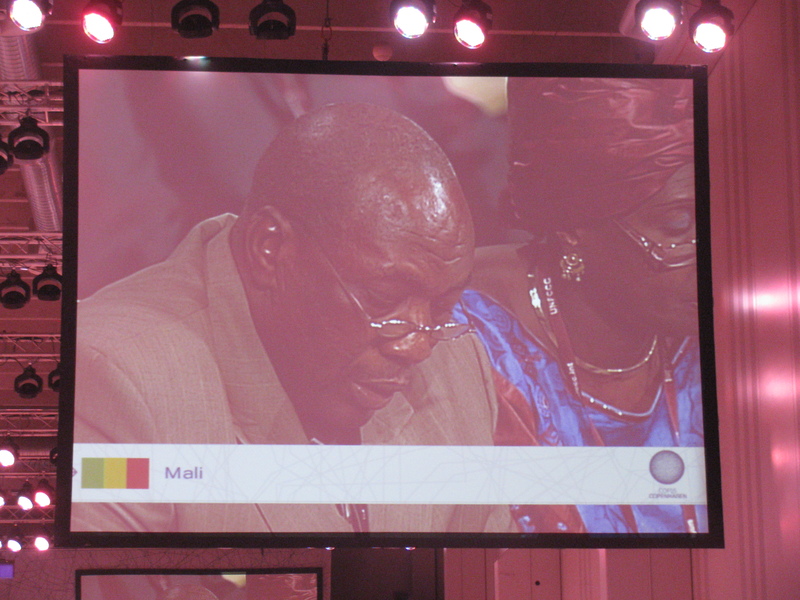 Several people in the audience commented on the need to strengthen ties between Senegal and the African Diaspora in the U.S., to remedy the deleterious impact that the slave trade had on west African populations. 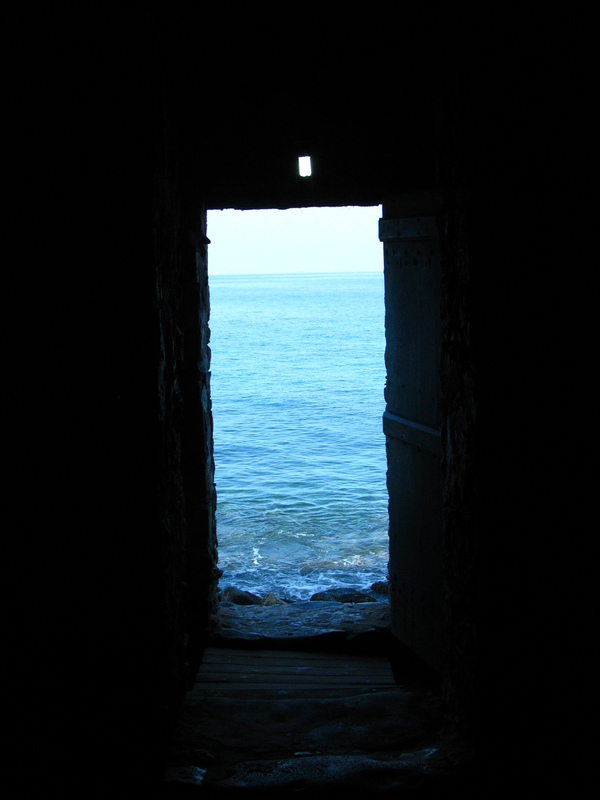 Looking westward out the door of no return at the Maison des Esclaves on Ile de Goree. The second came in the form of a no-nonsense reply by well-known UCAD history professor, Dr. Ibrahima Seck (scroll down this BBC page and see his short bio and picture), to several audience members who contended that Africa did not know slavery before the Europeans arrived. “Know your history,” he said, while lamenting the gap between well-published research on the issue and people’s common knowledge. Slavery was a normal incident of war, with those captured in battle enslaved to the victors. While this form of slavery is seen as qualitatively different than the human-as-chattel form it took in North and South America, it is well documented that various west African tribes sold their slaves for gunpowder and arms to European slave traders who plied the coast. Although the NYT and the Climate Progress blog didn’t report any news today about Copenhagen Accord pledges received by the January 31st deadline, the BBC did. Richard Black’s blog mostly talked about the un-deadline nature of yesterday, but then announced at its close that the UNFCC C secretariat had just posted the results. Under a small news headline at the bottom of this page, you’ll find a press release which states that 55 countries accounting for 78% of global emissions have submitted national pledges to reduce their GHGs by 2020. 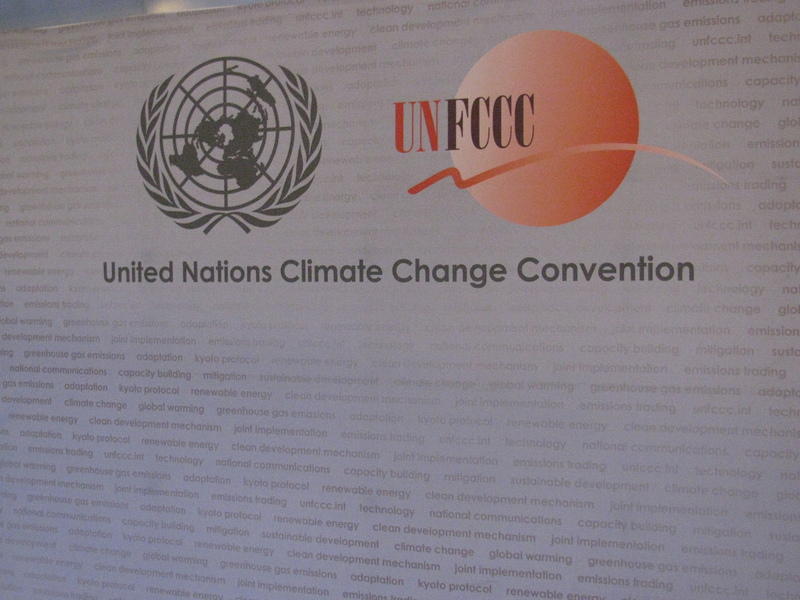 Yvo de Boer, Executive Secretary of the UNFCCC, observed that “the commitment to confront climate change at the highest level is beyond doubt. 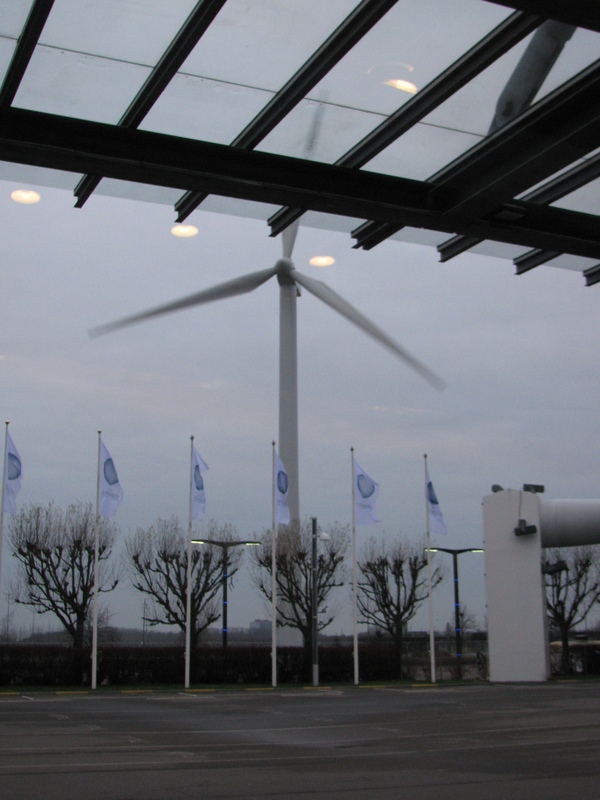 These pledges have been formally communicated to the UNFCCC.” Industrialized countries’ targets are here and developing countries’ proposed mitigation actions are here. (Also look at U.S. Climate Action Network (CAN)’s graphic here.) Notably, the U.S., Australia, and Canada, which were laggards under the Kyoto Protocol, are the only countries in the 11 currently listed on Appendix I (treating the E-U as one) NOT to use the 1990 base year. N.B. The NYT just rang in this morning, Tuesday, February 2, on the pledges received by the deadline, noting that Mexico (host of the next COP) had not yet signed up, nor Russia. Interestingly, South Korea is reported to have already passed a national law to act on its international pledges, which recalls Brazil’s efforts noted in this earlier post. Et tu, U.S. Senate?